As we gear up for this year’s release of the next Queensryche album The Verdict, let’s look back at a different edition of their last album Condition Hüman. For our original 2015 review of Condition Hüman, click here! It is almost customary now. When a band comes out with a new album, there has to be a crazy deluxe edition with vinyl and CD. The best of these editions are the ones that include exclusive music. In the end, all the posters and booklets in the world add up to only paper. Exclusive music is the thing of real value. Queensryche did well with their Condition Hüman deluxe. It was available in a variety of colours. This one is yellow, number 659/1000. There’s a cool turntable mat inside, and a double sided poster. For music, the album is split onto two coloured 180 gram vinyl records, including the Japanese bonus track “Espiritu Muerto” on Side D. (The D-side is also etched with the Queensryche logo in the empty space.) For your convenience, the entire album including Japanese bonus track is duplicated on the CD inside. Then for the diehards comes the true exclusive: two more songs on a 7″ single, not on any other version of the album. This is the real reward for spending the extra money on the deluxe. “Espiritu Muerto” chugs heavily along, punishing the skulls of unbelievers. On the 7″ record, the two exclusive songs are fairly non-descript. “46° North” is B-side-ish, like a leftover written for Empire but dropped in favour of something more commercial. “Mercury Rising” is on the other side, with a vaguely psychedelic metal vibe and science fiction lyrics. Condition Hüman itself is a strong metallic album, though with hindsight perhaps too “metal” for its own good. There was a time, not so long ago, when fans would have begged and pleaded with Queensryche to write just one new song in the vein of Condition Hüman. Now that we have two albums solidly back in the metal genre, it would be nice to hear real diversity in Queensryche again. That said, Condition Hüman is a damn fine album for what it is. The Queensryche of today, fronted by Todd La Torre, has been determined to retain trademark elements from Queensryche’s 80s heyday. That includes strong riffs, dual harmony solos, and screamin’ vocals. These are all delivered with gravy on top. The vinyl experience of Condition Hüman is actually superior to that of CD. It was always a long album, with the standard edition being 53 minutes of pretty relentless stomping. On vinyl, you’re forced to pause and flip the record three times before even getting to the single. These brief respites allow you to breath and absorb. What I’ve absorbed is that Condition Hüman is still a damn fine collection of songs, if a bit too single-minded. One gets the impression from this album that, though good, Queensryche can still do better. This audio goes with the text of Eddie’s interview with me in October of 2001. Links to the complete text can be found below, but why read when you can listen? The audio has remained in my dusty archives…until now. This was a great in-depth chat about the band at the time, lineup changes, and the Live Evolution CD that they were currently promoting. Give it a listen from the pre-digital age. Cassette, baby! There is no doubt that a decade and a half of war has dramatically changed the United States. In 2009, Queensryche decided to deal with their feelings by writing a concept album on the subject. It’s something that they do very well, and American Soldier, the finished product, was another ambitious piece of work. Although the album was mostly written by Geoff Tate and his friends Jason Slater and Kelly Gray, in reality it’s the last good album the band made with Tate. The band interviewed soldiers for this album, and their words are a huge part of the record. The track “Unafraid” opens like this, creating a hauntingly serious atmosphere. At times, the music is toned down, allowing the dialogue to speak. It’s an interesting effect and certainly it works in creating the mood that the band were going for. I think it is also a token of appreciation to the soldiers who defended the country. They had a chance to speak their minds, and be immortalized in music. That’s pretty cool. The end result is a good album that is not necessarily easy to listen to. There is no “fun” in this music, it is dead serious the whole way through. The intensity burns and you can hear that Tate was focused like a laser on this project. The songs are fine; not Mindcrime quality but I don’t think that anthemic progressive rock would have fit American Soldier. The single misstep is the vocal by Tate’s daughter Emily on “Home Again”. What was meant to be a dramatic, emotional focal point is instead distracting. Among the best tracks are “Sliver”, a cool opener featuring an actual soldier (A.J. Fratto, a 14 year vet) barking orders with the music. Fratto ended up touring with the band in support of this album. Well done, sir! “Hundred Mile Stare” is slow and intense. The hundred mile stare in the song is a variation of the thousand yard stare — a distant look in the eyes a soldier gets after they’ve been in the field too long. “A Dead Man’s Words” is another complex highlight, middle-eastern in style and clearly about conflict in that region. This one is perhaps the most “Queensryche” of the songs, in the sense that you can hear their classic sound at play. This includes a Tate sax solo, something I wished he did more of with the band. Then, for choruses, I have to go with “The Killer”. For sheer intensity, it’s the soldier’s story on “If I Were King”. If you want heavy ‘Ryche, then “Man Down!” is the track for you. One disappointing factor in American Soldier only hits you when you open the booklet. Great artwork aside, it’s really too bad that Tate relied so heavily on his buddies to make this album rather than his band. Drummer Scott Rockenfield has two co-writes, and that’s it. Damon Johnson from Brother Cane has just as many co-writes. The rest of the credits are variations of Tate, and producers Jason Slater and Kelly Gray. Queensryche were down to four members at this point, so Johnson and Gray subbed on guitars. Although Promised Land was probably the most deeply personal Queensryche album, American Soldier is likely the runner up. At least for Tate and his collaborators, there is obviously a lot of their hearts and souls invested in this. Unsurprisingly, it is not an immediate album. It requires time, but it also requires space between listens. There’s no glory here, just stark reality, so take your time. 10 years ago, when this project finally saw the light of day, a lot of fans were expecting it to be 1988 all over again. However, there were many reasons why they shouldn’t have. 1. Longtime guitarist/songwriter Chris DeGarmo, such an integral part of the original Mindcrime, had been out of the band for quite some time. 2. Geoff Tate’s voice didn’t have that high-note power it once had. 3. The band never intended to pretend it was still 1988. This album is a continuation, 18 years later, and as such the music has changed somewhat as well. The albums are meant to complement each other, not duplicate each other. The story picks up with Nikki, the anti-hero from the original Mindcrime, finally being released from prison, 18 years after the events of the first album. He begins to piece together his memories of what happened. He decides to pay Dr. X a visit (“X marks the spot”, goes the lyric), who is deliciously played by the late Ronnie James Dio. For die-hard Dio followers, this was a real treat. Dio sings as if in a stage production, which I’ve never heard him do before. Pamela Moore reprises her role of Sister Mary, playing a larger role and appearing on more songs. She’s a great complement to Geoff Tate, who clearly revels in the chance to do something dramatic like this. New second guitar player Mike Stone (ex-Criss) gels very nicely with Michael Wilton, playing dual guitar leads that Queensryche of old would have been proud of. At the same time, modern technology has creeped into the production in the form of sequencers and samples, to remind us that this was 2006. Still, Eddie Jackson’s bass had never been recorded this well before; he should be very proud of his rumble. Scott Rockenfield’s back to playing some serious metallic drumming as well, leaving behind some of his tribal influences for the moment. So, the actual sound of Mindcrime II is amazing. The songs however are not up to the very high standards that Mindcrime I set. There is no “I Don’t Believe In Love” or “Eyes Of A Stranger”, although some songs like “The Hands” come pretty close, with an amazing metallic riff and great chorus. (Did anyone else notice a few bars of music from “I Don’t Believe In Love” within “The Hands”? Listen again.) “I’m American” is lyrically fantastic, and angrier than anything Queensryche has done since Q2K. “Chase” is the one featuring Dio, and the one I keep coming back to. The thing about Queensryche albums is, they do tend to get better with time. Maybe they were always slightly ahead of the curve, or more likely they just take a few listens to absorb. It’s been a decade now, and few of the Mindcrime II songs remain lodged in the my brain. Meanwhile, I could hum any song from the first one. In particular, the second side of Mindcrime II really takes a drop. Tracks like “Fear City Slide” do not have the impact of “I Don’t Believe in Love”, and the closer “All the Promises” fails to deliver. It’s a concept album after all, and the last song is like the last scene in a movie. It should be memorable. Will Mindcrime II ever become classic like the original? Doubtful. As soon as you name something with a “II” behind it, you’re painting yourself into a corner, but Queensryche have done about as good a job as the fans could have expected. It seems many fans have warmed up to it over the years, though it certainly cannot be considered equal with the original. As if it was not abundantly clear on their last album (2013’s self-titled), Queensryche seem to have no intentions of abandoning their heavy metal roots again. Furthermore when you have a significant lineup change, such as a new lead singer, you can’t just stand still. You have to keep progressing forward. The ‘Ryche used their last album to re-ground their sound, but for a followup you need more than that. Condition Hüman pushes the boundaries out once more, but not without keeping the metal intact. Indeed, “Arrow of Time” sounds as if the quintet had been ingesting nothing but classic Iron Maiden for breakfast. Swift and viscous, “Arrow of Time” gets the job done in the requisite four minutes but not without exploring the exotic side of metal riffing. Imagine an alternate reality where Queensryche did not go in the highly technological direction of 1986’s Rage for Order album. Envision instead a timeline in which they followed The Warning (1984) with an album that continued to progress, but also go heavier at the same time. That album would have been Condition Hüman. “Hellfire” demonstrates this as well; the song would have fit on a heavier version of Rage. “Guardian” demonstrates this even more clearly. With the vintage-style screams and vocalizations (Todd La Torre for MVP), metal riffing, but also Mindcrime-like progressive rock, Queensryche have hit upon a satisfying balance. Songwriting credits are various combinations of all five band members; all but “Eye 9”, written solely by bassist Eddie Jackson (a first, I think). The album has a cohesive sound, like five guys all pulling in the same direction. The production, by Zeuss, is punchy. Queensryche have always employed elements such as sound effects and programming, and Condition Hüman has these fixtures as well. Moving on, “Toxic Remedy” is Mindcrime-like, but denser and massive sounding. Pay attention to the way Todd La Torre layers his vocals on “Toxic Remedy”. He has arranged the vocals in his own way; this is not a carbon copy of something else. “Selfish Lives” is the same. Yes, there are hooks and melodies that sound very Queensryche, but Todd is showing off his own personality more than before. And he’s not taking the easy way out on any of it! Sounds like he is really pushing his own limits, especially on “Selfish Lives”. It’s quite remarkable how lucky Queensryche were to find a compatible guy like Todd, who is also able to stretch it out. Another album highlight is the rhythmic “Eye 9”, the aforementioned Jackson composition. This Queensryche-meets-Queens of the Stone Age track blows the doors wide open in terms of direction by putting the rhythm first. It sounds like Queensryche, yet nothing like any prior Queensryche, simultaneously. “Bulletproof” puts a new slant on the Queensryche power ballad, keeping the emphasis on the power. La Torre makes it his own — listen to the last note he sings. Sends chills up the spine. Speaking of chills, crossing the acoustics with the heavy chunky riffing on “The Hourglass” did exactly that. There are Pink Floyd influences coming up to breathe from time to time on Condition Hüman. This is most obvious on “Just Us”, which is also very much like the slightly psychedelic acoustic side of Led Zeppelin. Queensryche have never done anything like “Just Us” before. “Silent Lucidity” this is not. The soulful singing at the close of the song is also unlike anything on a prior Queensryche song. Holding out for the Japanese edition of the album, the bonus track “Espiritu Muerto” is the bonus track worth waiting for. Going sludgy for 3:40, but topped with a soaring chorus, the bonus track is in the mold of the album but different just the same. It’s a long album though, and adding more material (even if good) can sometimes push a CD just a bit too far in terms of attention span. “Espiritu Muerto” is close to this line, but because it has enough personality of its own, it’s worth staying around for. If any of these songs sound intriguing to you, check out Condition Hüman. Fans who wonder where Queensryche could have gone had they adhered to heavier roads will find much to enjoy. They have never taken the easy way with any of their albums, but it is hard to imagine a fan of early ‘Ryche who won’t find something here to love. As bad as things got at the end of the Tate era for Queensryche (cabaret, anyone? ), Take Cover was a musical low. 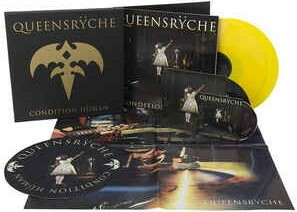 Queensryche were busy in 2007, with a double live performance of both Mindcrime albums (Mindcrime at the Moore), a double best-of (Sign of the Times featuring a new song called “Justified”), and Take Cover, a covers album. Considering the number of releases in 2007 (double CDs no less), Take Cover looks all the less necessary. The five members of Queensryche each chose some songs for the album, and you have to admit that most of these choices are pretty cool. Where things go sideways is in the recording of them, and it usually comes down to Geoff Tate’s voice. Floyd’s “Welcome to the Machine”, which opens the album, should have been a slam dunk. The dark musical backbone is there, but Geoff’s shaky multi-layered vocals do not send shivers up the spine the way Gilmour’s did. It’s nice that Geoff threw some of his trademark sax in here, and the solos (Michael Wilton and Mike Stone) are great. The problem is the vocal and that’s a big problem. “Heaven on Their Minds”, from Jesus Chris Superstar, was chosen by Mike Stone, who left the band after this album. Musically this works, and I never would have guessed its origin just from its metallic riff. Thumbs up for this one, no complaints about the singing. CSNY’s “Almost Cut My Hair” is a dud though, and they should have left well enough alone. Following that is a flat “For What It’s Worth” (Buffalo Springfield), a double whammy of stinky renditions of hippy anthems. Thanks Geoff, for picking those two…. From Freddie Mercury to Ronnie James Dio, there are some difficult vocalists here to cover. Right there are two of the greatest of all time, without question. Geoff struggles a little less with the Dio approach on “Neon Nights”. But he’s absolutely screwed on “Syncronicity II” by The Police. Scott Rockenfield, who I have always thought must have been a Stewart Copeland fan, picked this song. One of the things about the original was how effortlessly Sting sang it. He hit each note perfect and cleanly. Geoff is wavering all over the place, and it robs the song of all its biggest hooks. As much as Take Cover is a slog to get through, “Bullet the Blue Sky” is arguably enough to make it worth it. Hearing that, I was excited. Not for the idea of “modern dance”, but for the Rage For Order vibe through a time tunnel. That could have been good. Unfortunately those are just words. Dedicated to Chaos may have elements from Rage and Promised Land (samples) but it is lightyears away from anything “rock”…certainly not “a big rock thing” as Rockenfield claimed. Is it progressive rock? Who cares. It’s not good enough for a band of Queensryche’s stature. Tate’s friends Kelly Gray, Randy Gane, and Jason Slater also collaborated, watering down the attempt at re-integrating the band members. The impact of Jackson, Wilton and Rockenfield can barely be felt, even on the songs they co-wrote. So here we are with Dedicated To Chaos, supposedly a rebirth but actually a funeral. It could have been my favourite album since Promised Land, had they delivered what they promised. The guitar patterns are more drony than riffy. There are electronic effects, as indicated. There is a huge emphasis on rhythm, but not necessarily groove. To its credit, much like Promised Land and Rage, there are unfamiliar sounds coming from everywhere. 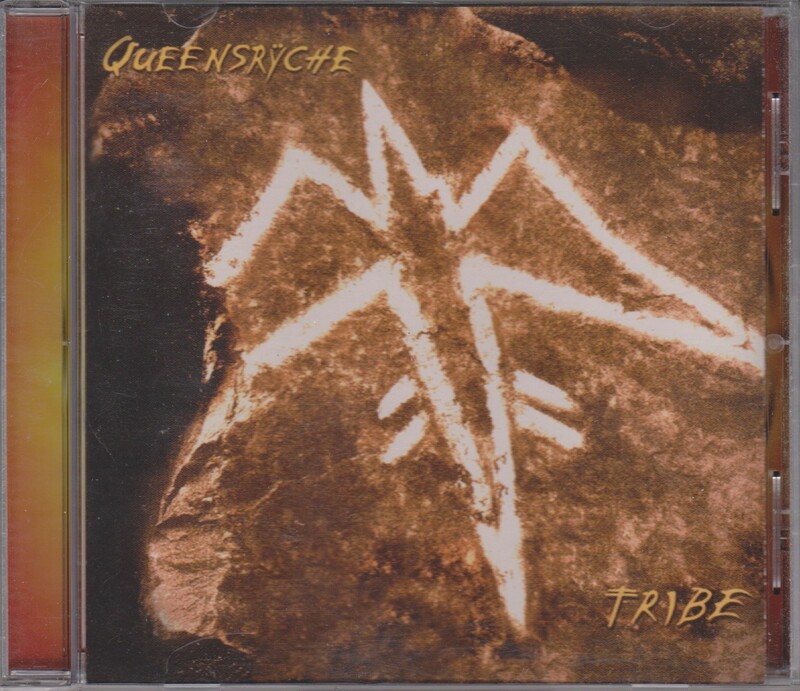 Some are percussive, others are more musical, but this is another true headphones album from Queensryche. If you actually wanted to hear what they were up to. Which I do not, I’ve given it a chance. I listened intently when it came out, and initially gave the album a rough grade of a 4/5, assuming it would grow on me. It did the opposite, and I liked it less with each listen. This layout annoys me to no end. My biggest complaint with Queensryche was Geoff Tate’s aging voice. It seems to have lost so much range and power over the years to the point where I can’t listen to Take Cover at all. The voice isn’t getting any better. At least it was recorded better than Take Cover. He’s using more of his own voices too. This is done particularly well on “Got It Bad”. The positives: “Get Started” which sounds almost Empire-lite. Melodically strong was “Around The World”, which also has a nice positive message. You’ll hear more of Tate’s sax on “Higher” which is a modern sounding song with just a pinch of funk, yet with dual guitar solos. Lyrically, we’re all over the map. “Retail Therapy” is just pissed off at the world. “Around The World” has a kum-bay-a peace and love message. We’ve even got some civil disobedience and the hint of a conspiracy theory in “At the Edge”: “Time to look at what’s behind closed doors, Got gasoline, ammunition, like 911, a controlled demolition.” It also happens to be one of the best and longest songs on the album. The negatives: Most of the bulk of the album. It’s just forgettable. Go ahead — tell me how “Luvnu” goes. Can’t remember, can ya? 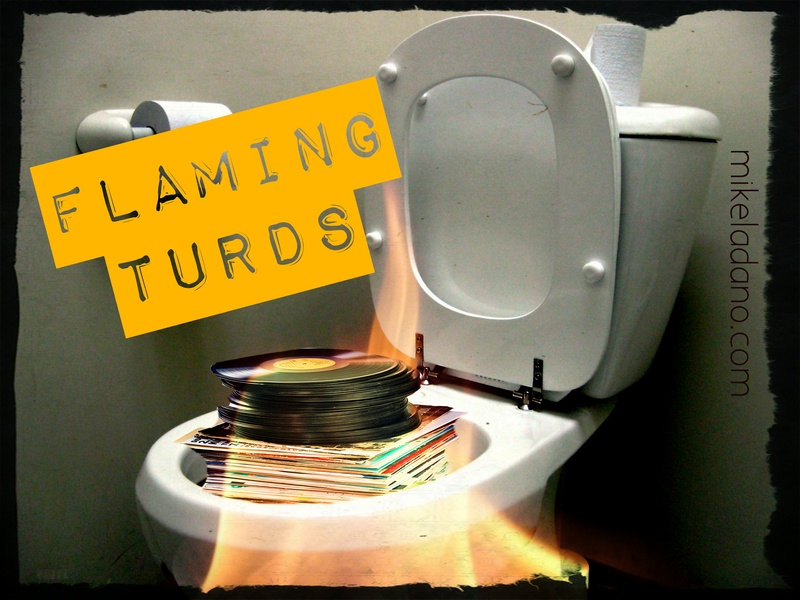 This piece of crap was written by Tate with his buddies Randy Gane and Kelly Gray. Surprised? The “special edition” had three bonus tracks. They are mellow and atmospheric, but worth having only to the fan and collector.